Tamago is a sweet Japanese omelet used in making maki, nigiri and Temaki sushi. But you can just serve it as is with wasabi and soy sauce if you like ^_^ I learnt of this recipe from my friend in the Philippines who is a pastry chef and would like to share this with you all as well. I have done this before but you need quite a bit of practice to get it perfect which until now I have a hard time with. What I need to work on is making sure that I get as little browning as possible. You want it to be as solid yellow as possible. Spatula for flipping or if you are used to using chopstick then use that! In a bowl mix sugar and warm water until it dissolves. Add in 6 eggs and mix well. 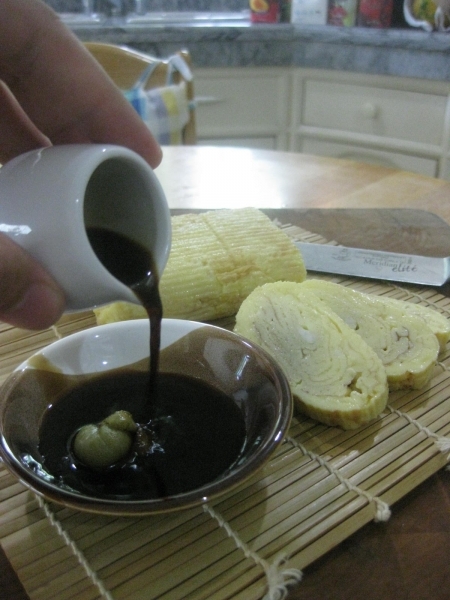 Transfer the Egg mixture in an easy to pour container before you start making your tamago. Now that you have your egg mixture you are ready to make your tamago. First add a little bit of oil in your pan and wipe off the excess with a small piece of tissue paper. Then over medium heat pour a thin layer of egg over the pan and spread it out evenly by tilting the pan up and down. Just as the eggs set you can start folding, an inch over towards you, the eggs with your chopsticks or spatula. Continue folding until you reach the other end of the pan. Push the egg to the end of the pan farther from you and wipe the pan with the oiled tissue paper then you can add another layer. Keep doing the same step over and over until you finish all the egg mixture. Make sure that your heat is regulated just so the egg doesn’t brown. When you are done, flip the tamago over a sushi mat and wrap it around securing it with rubber bands. This will make sure that it firms up and so that it holds the rectangular shape. The tamago will be soft while it is hot and may still have raw eggs ozzing out when you wrap the sushi mat but that is fine. As it cools it will firm up. Let it cool before wrapping with plastic and placed in the chiller. When Chilled unwrap the tamago and slice about a centimeter thick for each piece then serve. Where can I buy the tamagotchi pan in Hong Kong? I go to a lot of difference places. Sogo sometimes…Mong Kok or Causeway Bay has cute little stores…they seem to be everywhere! Thanks for your response. Just bought one at Citysuper. In fact, I was told by the staff at Sogo that Citysuper got it.